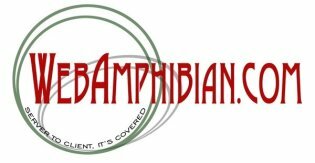 WebAmphibian.Com always tries to keep our costs low by using Public Domain and or 'Share-Ware' tools where possible. These low cost tools, books, and references help to keep WebAmphibian.Com products inexpensive. There are a number of different web services and resources that have been proven to be useful over the years. A great number of these are put onto the web for free (or at very little cost) by their authors. There are too many books in the WebAmphibian.Com library to name them all. But here, we'll try to list a few of the more influential ones we've come across.